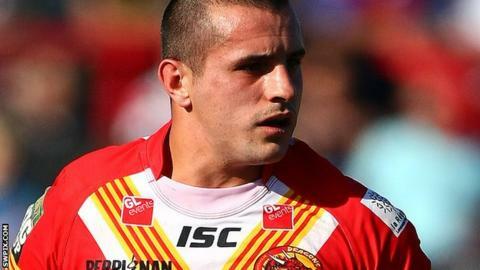 Catalan Dragons eased to victory over Salford City Reds, despite playing for 77 minutes with just 12 men. Prop Julian Bousquet was dismissed for a dangerous tackle on Theo Fages. But the French side shrugged off that inconvenience, Vincent Duport scoring two of their seven tries in Perpignan. Remi Casty, Steve Menzies, Ian Henderson, Olivier Elima and Daryl Millard also went over, Thomas Bosc kicking six goals, while Niall Evalds crossed for Salford's solitary try. Salford began their Super League campaign with a 42-0 drubbing at the hands of Wigan eight days earlier and head coach Phil Veivers had stressed repeatedly that his new-look team will take time to gel. But their hopes of success were boosted when Bousquet was sent off with less than three minutes played. Teenager Fages left the field on a stretcher after receiving a high and late hit. However, the Dragons' forward power proved pivotal as Casty and veteran Menzies both crossed for tries in the first half, centre Duport also touching down for the first of his brace to give Catalan a 10-point lead at half time. A try from Evalds, who had replaced winger Danny Williams in the visitors' line-up, and a successful kick from on-loan Wigan full-back Jack Murphy had earlier reduced the deficit to six, while Salford missed further chances to close the gap. Although a man light, Catalan ran away with the second half, helped by early scores from Henderson and Elima, as well as the reliable boot of half-back Bosc, who failed with just one of his seven conversion attempts. A second Duport try and Millard's run in from distance set the seal on a second win from two games for the Dragons under new coach Laurent Frayssinous. "It was a good win for us and I'm especially pleased with the defensive effort of the guys. "For us to only concede one try with having a man less for most of the game speaks volumes about the character of the team. "We won't tell Julian what he has done is wrong. I don't think it is a late challenge, but just perhaps the timing is out a little." "I was disappointed with the cheap shot on the little half-back, who got took out by the big number 21. It was a very cheap shot. "I thought it was outlawed in this game and the referee dealt with it correctly. It had a big bearing on the game for us - having four forwards on the bench detracted from the way we wanted to play. "It's two weeks in a row that we're talking about the same mistakes. It's got to sink in shortly. "Possibly that is down to inexperience within the squad but you cannot excuse the amount of dropped balls we came up with tonight, the amount of cheap penalties we conceded and how we finished our sets, especially in the second half." Catalan Dragons: Webb; Blanch, Menzies, Duport, Millard; Pryce, Bosc; Bousquet, Henderson, Casty, Taia, Anderson, Baitieri. Replacements: Elima, Mounis, Pelissier, Fakir. Salford: Murphy; Broughton, R. Williams, Nero, Evalds; McGoldrick, Fages; Jewitt, Godwin, McPherson, Ashurst, Dixon, Neal. Replacements: Gledhill, Boyle, James, Owen.